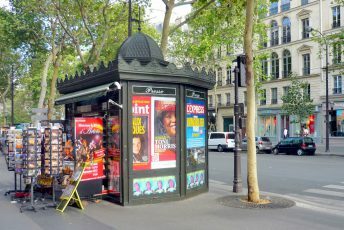 Whether you’ve been to Paris or have seen photos and movies shot in the French capital, you’ve probably heard about the dark green newspaper kiosks that were originally commissioned by Baron Haussmann in the mid-19th century. 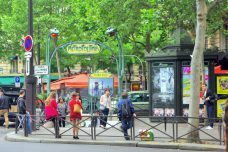 Following a recent decision made by Paris’ mayor, Anne Hidalgo, the iconic news kiosks are being replaced by June 2019 by a modern and more comfortable structure. 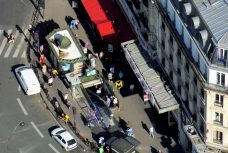 Parisians are in an uproar over the loss of the ornate kiosks. So much that a petition against their demise was signed by over 58,000 people. 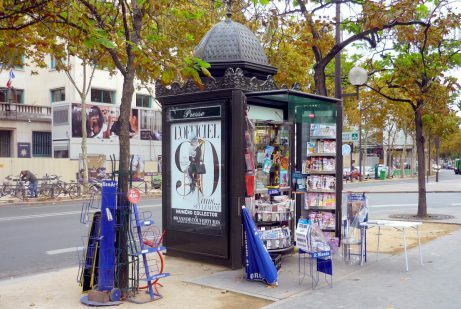 For the newspaper kiosks are part of the daily life of Parisians… and tourists alike! When Baron Haussmann undertook the great urban work across the city of Paris, a series of cast iron structures were set up along the newly opened boulevards. All street furniture was harmonised in the same style and dark green colours. This was true for Morris columns, pissoirs, benches, lampposts, and by the 1870s the Wallace fountains. The Paris newspaper kiosks were no exception to that rule. They were also codified to show a little pointed dome (such as the Morris columns). The newspaper kiosks were designed by French architect Gabriel Davioud in 1857. He was the main collaborator of Baron Haussmann and his works included the magnificent entrance gate of Parc Monceau, the Saint-Michel fountain and the Châtelet theatre. 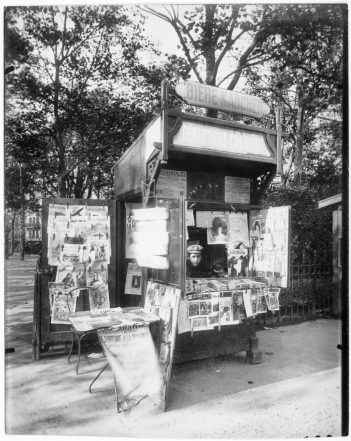 The first news kiosk opened on the Grands Boulevards and it was rather small compared to today’s structures. The newspaper kiosks I’m referring to are the dark green metallic structures that can be seen today (as in 2018). Their roof is topped by a pointed dome surrounded by a metallic frieze. For many they contribute to the charm and the appeal of a romantic Paris that tourists love. A few kiosks are exclusively dedicated to selling theatre and concert tickets. Knows as “Le kiosque théâtre“, they have the same shape as the news kiosks. 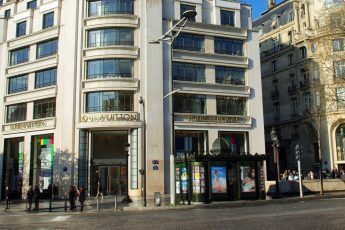 But what I’m about to tell you may disappoint many… for believe it or not, that type of kiosk has nothing to do with the ones Haussmann knew – although inspired by his style. In fact, these newspaper kiosks are only recent imitations that date back to… the early 1980s. They consist of rectangular cabins in plastic on top of which a 19th century-looking-like dome has been added. 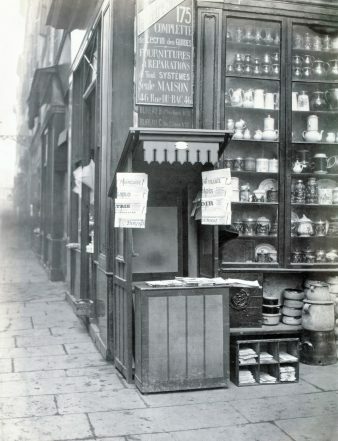 The original version of the Paris News kiosks (the one that dates back to the 19th century) has long since left the pavements. Moreover another type of kiosk was introduced in the 1970s without much controversy. The sharp-edged structure in smoked glass can still be seen on the streets and squares of Paris. It has to be acknowledged that the 1980s imitations were designed to reflect the Haussmannian style and they did fit well along with the other street furniture (Wallace fountains, Morris columns, lampposts…). But their design had some flaws. They were not particularly comfortable for the news vendors. To improve their working conditions, the City of Paris came up with the plan to replace them with a better more practical design. Exit Haussmannian-style and the domed structure! The first new version of newspaper kiosks in Paris opened on the 11th April 2018 at 2, Boulevard d’Ornano (18th arrondissement) in the presence of Anne Hidalgo, Mayor of Paris and Jean-Charles Decaux, co-CEO of J.-C. Decaux, world leader in street furniture. By June 2019, 360 Newspaper kiosks will be renewed across the French capital following a design by Matali Crasset. Made up of recycled glass and aluminium, they will continue to match the city’s benches and Morris columns with the characteristic dark green colour. However the emblematic pointed dome is no more, leading opposers to nickname the design as a sardine can. The streetside kiosks will feature heated floors, interactive screens, post boxes, and removable windows to protect the vendor and his clients against bad weather. Don’t panic, some Haussmannian kiosks will be kept just for you! For those of you who are sad about the disappearance of the old kiosks (the ones from the 1980s! ), don’t worry. The City of Paris recently announced that it will maintain 39 of them. They will be renovated one by one to stay on the streets and squares of Paris… at least in the touristy spots for everyone to capture their photogenic charm! un kiosquier, une kiosquière is a news vendor (male, female). un kiosque à journaux or un kiosque à presse is a newspaper kiosk or newsagent’s. i visited lots of country and cities, but never found such things ever. Its a good idea for readers. Thanks for sharing, if i ever visit paris i will definitely read and check out.